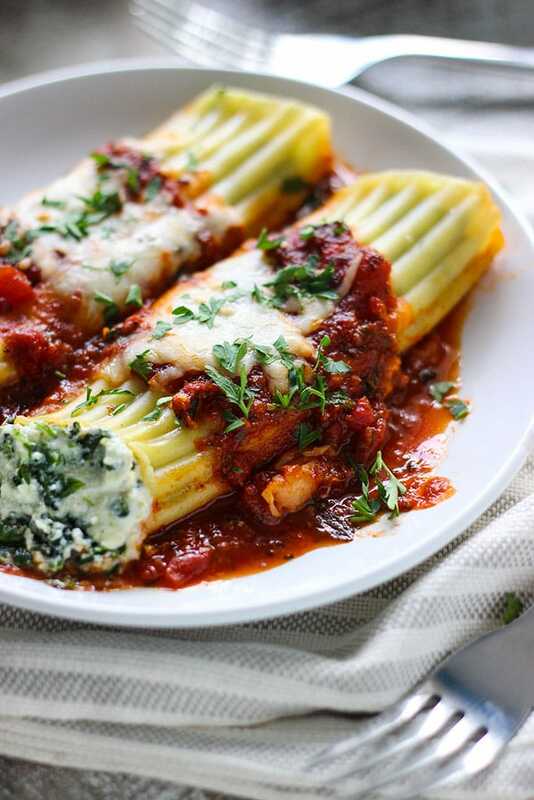 I’ve been wanting to try manicotti for awhile now, so here we go. 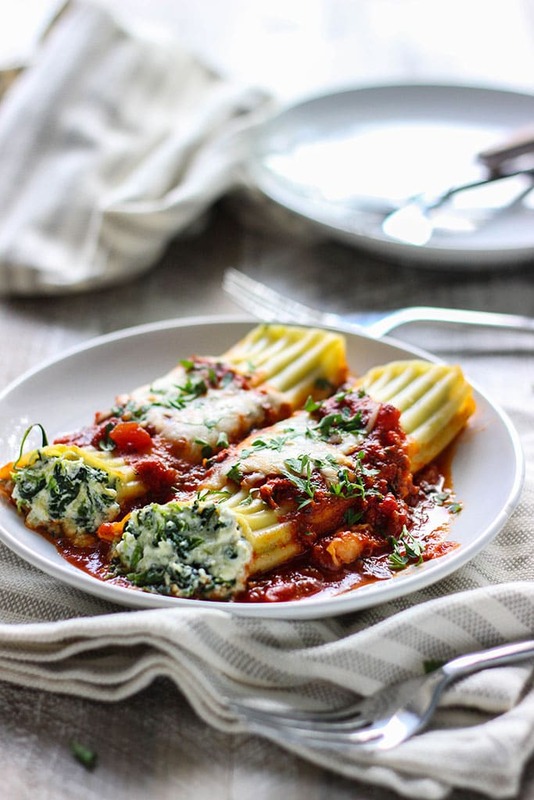 I love the idea of a creamy and rich spinach and three cheese ricotta stuffing served with marinara and topped with more melty cheese. 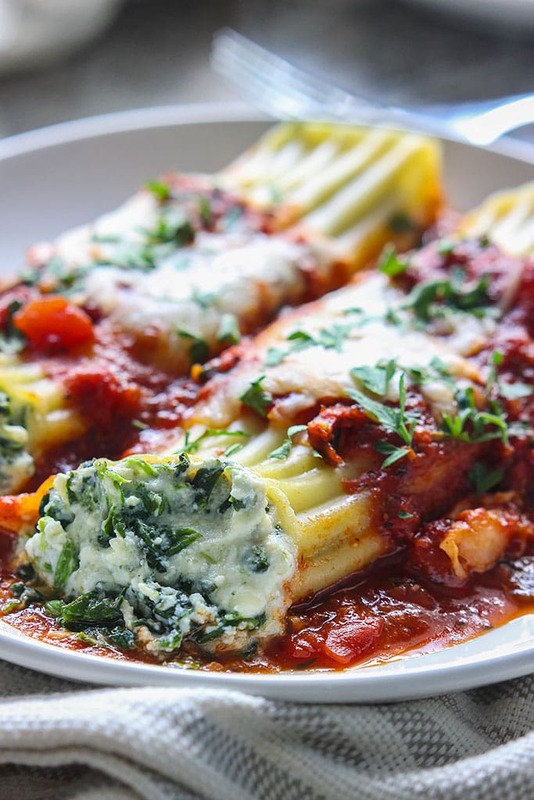 Since making these lasagna roll ups, I’ve been looking for an excuse to use more ricotta cheese. And here’s the perfect recipe for it. It was delicious! The ricotta was nice and creamy and so fresh with some cheese strings from the mozzarella inside. 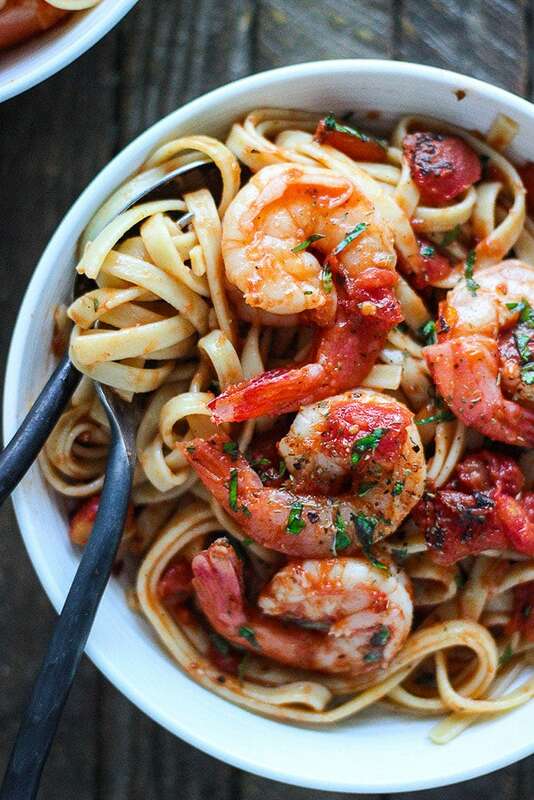 Paired with your favorite marinara sauce, this one really spells comfort food. So for vegetarians or those just wanting to cut back on red meat, here’s an alternative for you. It’s pretty much as straightforward as it looks. I’d say this would be for intermediate cooks or at least those who have some experience piping (first timer here). Instead of trying to stuff the manicotti shells with a spoon, I took to putting it all in ziploc bag and snipping a corner off to mimic a piping bag. It worked out pretty well, even with my inexperienced hands, but might deter some new to cooking. If you’re a baker though, this should be child’s play for you. I used about 10 manicotti shells for this one. The 8 oz. box I got had about 14 but with the amount of ricotta mixture I used, I only managed to overstuff about 10 of them. I figured it’s better to overstuff 10 shells then to understuff 14 so I went with that reasoning. It sucked a little because I hate wasting but I saw no reason to open up another tub of ricotta just for four more shells. So we start by bringing a five quart dutch oven to a boil. I added in some olive oil so the shells wouldn’t stick together. Not much is needed, just half a teaspoon or so. Cook the shells according to the package directions and be very gentle with them so they don’t tear. Some of mine tore when I transferred it from the pot to a colander to drain. The shells will also expand once it’s cooked so keep that in mind when you’re looking for a container to bake them in. A 9×13 casserole dish didn’t work for me so I ended up just baking them on a baking sheet. I also found it easier to separate and dish them out this way. In the end, it’s okay if they look messy, they will taste just as delicious. It was just a tad more stressful for me since I had to make sure they ended up looking nice for pics. Back to instructions, while the pasta is cooking, you can steam your frozen spinach according to package directions or start cooking down your fresh spinach. Either way, once they’re cooked, drain any excess liquid on a mesh strainer and use the back of a spoon to squeeze as much out as you can. You’ll want to do this so the ricotta mixture doesn’t end up watered down. So while the pasta is cooking, start mixing your ricotta filling, which doesn’t take too long at all. Once the pasta is cooked, carefully drain it in a colander and run the shells under cold water so they don’t stick together. 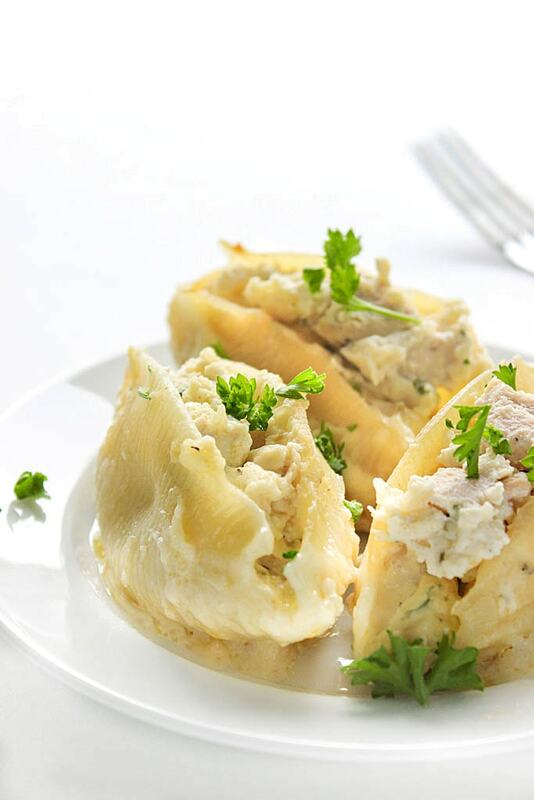 Tip: Once the shells are cooked, try using the plastic trays they came in to hold each one and to stop them from sticking together and flattening out! Load a one quart ziploc bag with half the ricotta mixture, seal the end and snip off a corner to act as your piping bag. I filled up the bag in batches of two because I found it unwieldy on a full bag. Squeeze in the ricotta mixture from one end while tilting the shell at a 45 degree angle so it slides down to the center. Fill up the other end until full and push both ends in gently to pack them tightly. Spread one cup of your marinara sauce on the bottom of a baking dish evenly. 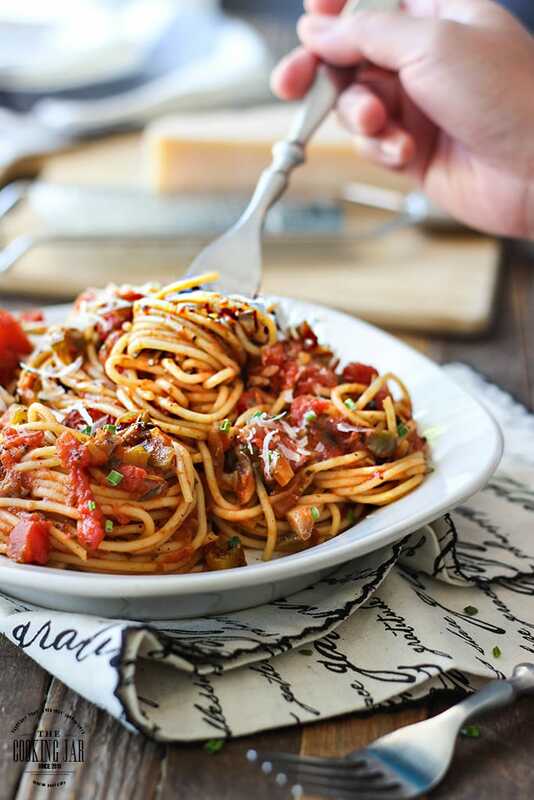 You can use store-bought marinara sauce straight from the jar if you don’t mind, or use your favorite recipe if you have one. I made a couple changes to the marinara sauce to the way I usually like it which is with a little sugar to balance out the acidity, some Worcestershire sauce and beef bouillon cubes to beef it up a little and a few Italian herbs and some red pepper flakes. Either way, go with super easy or customize it to your liking! 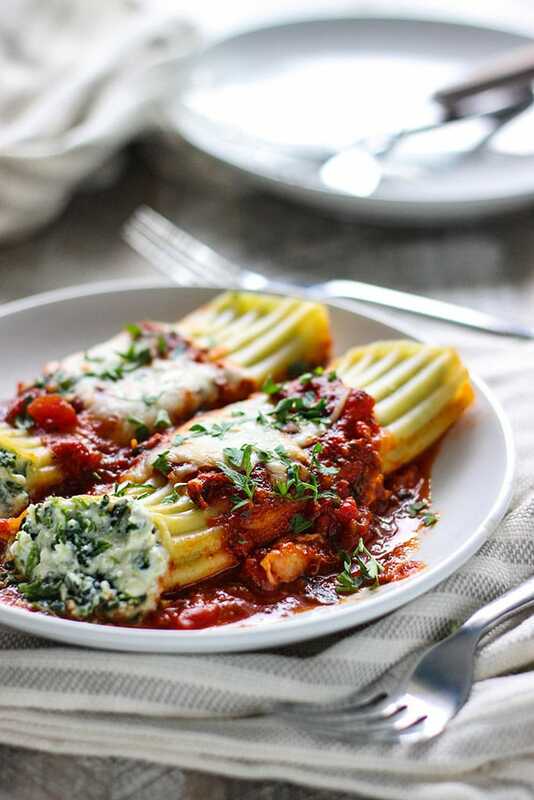 Arrange the stuffed ricotta shells on the baking sheet as you go until they’re all done. 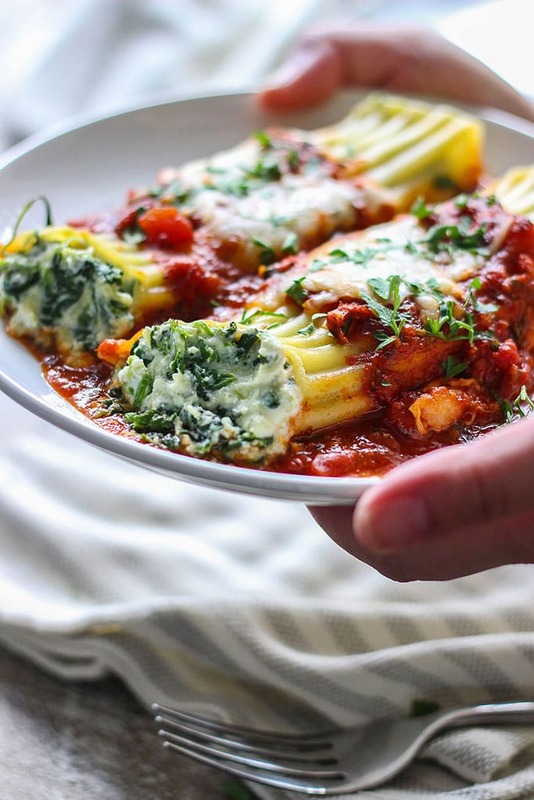 Top the shells with remaining marinara sauce and mozzarella and bake at 350 degrees F for 30 minutes. And that’s it! PS: I’ve combined the amount of mozzarella cheese needed under the filling ingredients so it’s easier to make a grocery list but keep in mind that the mozzarella cheese amount there is divided. 1 cup for the filling and 1/2 a cup for topping. I’m a little late here, but I am hoping you still might be able to help me out. 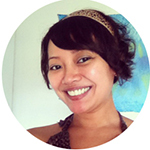 My son is allergic to eggs, do you know what I could use instead? 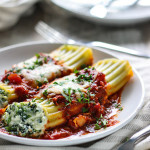 I looked up vegan manicotti and it just does NOT sound good so I want to experiment with yours! I have not personally tried it without egg as a binding agent in the filling but I’m thinking you could try breadcrumbs instead. There’s a whole lot of other suggestions I found on the internet on subs for egg as a binder like flax seed and water to make flax egg, but since I’ve never tried those, I can’t say much to them. I hope your experiment works out well! I can’t wait to make this this weekend! What’s the green garnish you put on top? Hey Lauren, hope it turned out well for you. It’s just a little but of parsley as a garnish. I don’t usually include garnishes in my recipes as they don’t affect the flavor profile and it’s just to make it look pretty (as garnishes should! ).